Last weekend, a group of yellow backpacks broke through the gray monotony of the stately buildings and rising monuments of Washington DC. Carrying the message “Together, Peace is Possible” through the wide tree-lined streets, they were enough to cause a few passerby to stop and ask where these kids came from. Coming from their camp in North Carolina, 29 K4P 7th graders from Israel, Palestine, and North America spent four days exploring the cultural offerings of the nation’s capital and meeting with important representatives. Their tour began with an exclusive meeting at the State Department, where a line-up of prominent politicians spoke about their peace-building work and shared their insights on conflict. “Politicians are afraid of religion, because they see it only as a source of conflict and violence,” said Sean Casey, Special Representative for Religion and Global Affairs. Other leaders present at the meeting were Betty Bernstein, who spoke about women’s equality, and Chris Hensel, who spoke about US relations with Israel and Palestine. Due to the recent acts of violence in Jerusalem, the kids all returned to the United Methodist Church to engage in group discussions and share their feelings about these events instead of visiting the next stop on the tour. There was a strong sense of solidarity, as tears, words, and vigil-like moments of silence were shed. Rabbi Scott spoke about these events at the Shabbat service at Sixth&I Synagogue which closed the evening with Shabbat services and dinner. The third day was just as packed as the first two. It began with a Christian service at St. Mark’s Church, which featured a sermon given by Josh Thomas, Executive Director of K4P International. The kids then visited the National Zoo and attended a closing potluck party at the DC Jewish Community Center. 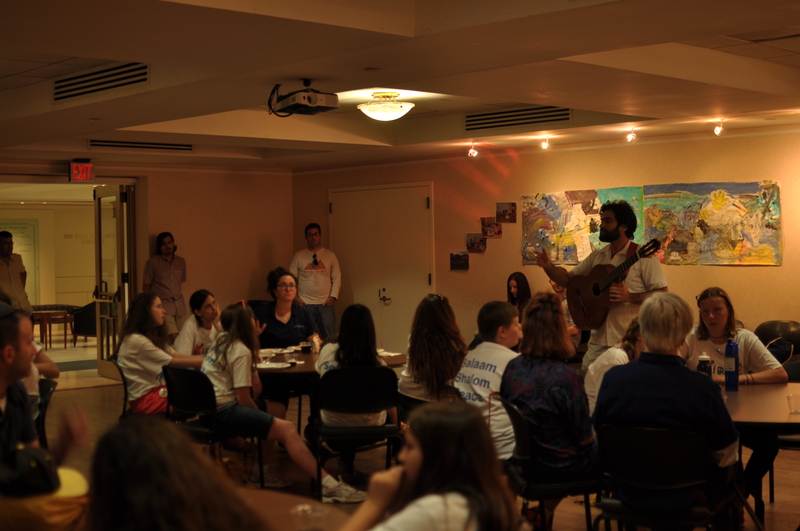 Featuring Aaron Shneyer from Heartbeat, a music organization which unites Israeli and Palestinian youth, this event brought together DC community members, sponsors, and K4P staff in a night full of song, dance, and testimonials.